What is it about fall that makes food taste so darn good? I always mourn the end of summer, but all of the warm, delicious fall foods quickly squash (pun intended) that sadness. I'm usually big on dinner and dessert comfort foods in the autumn, but occasionally I treat myself in the morning to a hot cup of tea or cider and a warm muffin after I take the girls to school. Sometimes I'll go hog wild and actually break out a pan and cook myself something hot in the mornings too. It's not often that happens when I am only cooking for myself, but it is good to treat yourself every once in a while. 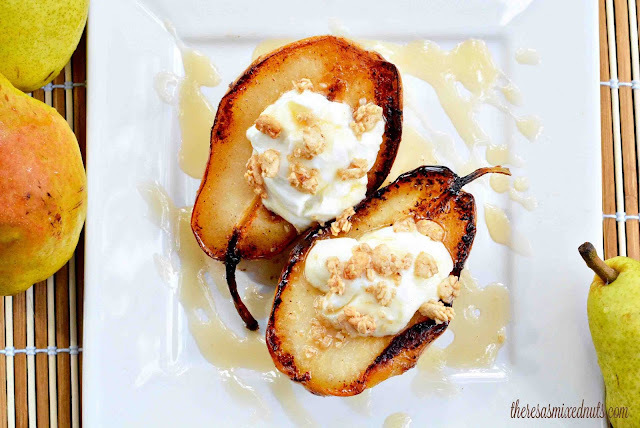 Pears are starting to go on sale at the market now, and I thought since I found a 5 minute breakfast idea for Warm Pears with Yogurt and Granola on Golden Blossom Honey, I was going to kick off fall with a home cooked breakfast earlier this week. Simple to make and packed with flavor, a girl could spoil herself starting off each day with a recipe like this. I did use the new Golden Blossom Raw Honey for an extra punch of nutrition to the recipe. If you want to add a little more fall pizazz, sprinkle a little cinnamon over the tops. Nom! How do you treat yourself in the fall? You don't eat yogurt Dezzy, or you just don't like fruit in your yogurt? I can't eat yogurt plain, but add in lots of fruits, and I love it! Our peaches are about wiped out as well. If we want them after this month, I am sure we'll be paying an arm and a leg for them. our yoghurt here is liquid and is usually drunk with savoury food, like with sammiches... so I drink my probiotic yoghurt five times a week, but I don't do fruit yoghurts just like I don't do sweet cheese :) as you know.... I've started with grapes this week, no more peaches here.... but the first pumpkins have arrived indeed and I will have to stack on my celery leaves and put them in the freezer before they disappear too. We're currently in the process of pickling food for winter in my country, roasting red peppers, making ajvar, pickling peppers and cucumbers, pickling peppers stuffed with cabbage, peppers with garlic, mixed veggies pickles etc. I just found a great drinkable probiotic yogurt that I love, but it's quite expensive here. But, with my current health issues, I buy it and drink it daily anyway. It really seems to be helping, so I won't complain about the cost. I need to invest in a deep freezer. There are so many summer items I would like to freeze to keep on hand for the winter months, but freezer space is a terrible issue. I never thought to cook pears like that. I've done that to apples. They were good! I bet this is wonderful! I'm pinning it to my fall board. I have never done apples like this. I usually bake them or put them in my dehydrator this time of year. I am going to have to try this method with them next! These look really good. I love fall foods and this sounds like it would be right up my alley. Fall foods are simply the best! That looks like the perfect start to any day. I love food that's healthy AND good for me. Yum! That looks so good! I am definitely going to try this soon. Looks like an excellent choice for breakfast. You make the most gorgeous yet simple recipes. I love them and save them in my bookmarks all the time! That sounds delicious. I hate eating plain yogurt but it always tastes better with fruit! This is a great way to start my day! I love how simple it is to make but full of flavors! Yumm!! That looks so good! I don't normally eat pears, but this would a wonderful breakfast to try out. Goodness this looks amazing and practically screams fall. Although it would make an ideal breakfast, I could see myself enjoying this for dessert as well. This looks like the most DELISH and healthy treat! I think my entire family would love this and can't wait to surprise them with it for brunch! This looks so delicious and easy to make. 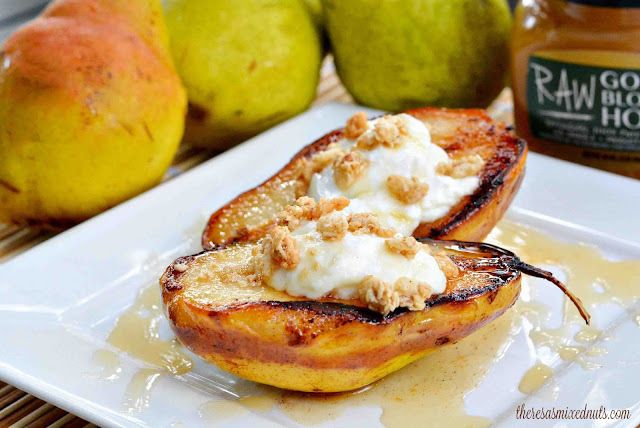 I will have to pick up some pears today so I can have this for breakfast tomorrow. Wow, that is perfect for breakfast. I am sure that my son and my hubby will love it! Oh wow, I have never had "warm" pears. That sounds really good, actually! I have heard of warm pears but I haven't tried the yet. This looks and sounds so good. This is such a sweet (literally) and simple recipe. I could eat it everyday. Looks very delicious and I like that's it's something different than what I'm used to. I like to try new combinations of flavors. I love pears! This is an awesome breakfast idea and one that I will never hesitate to try. I like that it's warm as well, perfect for the morning. This looks absolutely amazing. I am soo making this for my kids and myself tomorrow for brekkie!